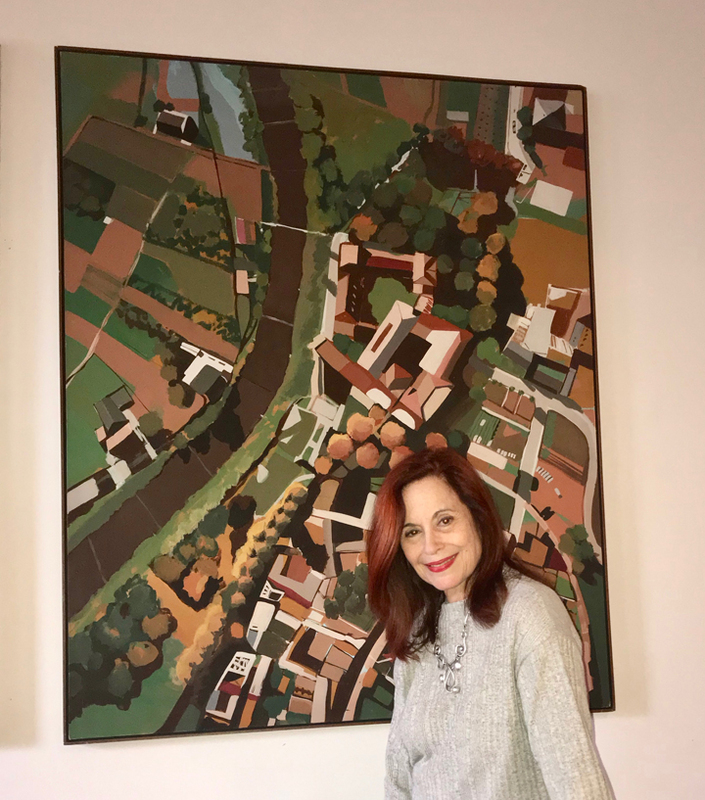 Color and compositional aesthetics form the focus for Toni Silber-Delerive, an exciting American artist whose refined, aerial-view paintings provide a fresh take on the contemporary landscape. Read on to see how she examines the interplay between worlds of power, labor and leisure from her musical Manhattan studio. Good morning, Toni! What’s the first thing you do when you wake up in the morning? As I wake up I like to take a moment in bed to let my imagination run free from the realities awaiting me. It’s a good time for creativity. I’m inspired by a desire to see the world around me from a different perspective. Ideas are born from things I see, dream, touch or observe. Creating is an extension of my vision. Living in Manhattan is always a space challenge but I’m fortunate to have a studio large enough to work on paintings of up to 48′ x 48,’ as I listen to music from my iPhone playlist. As an added benefit, I have a temperature-controlled storage space in the basement. My approach is different from the traditional landscape perspective, but still full of realism. 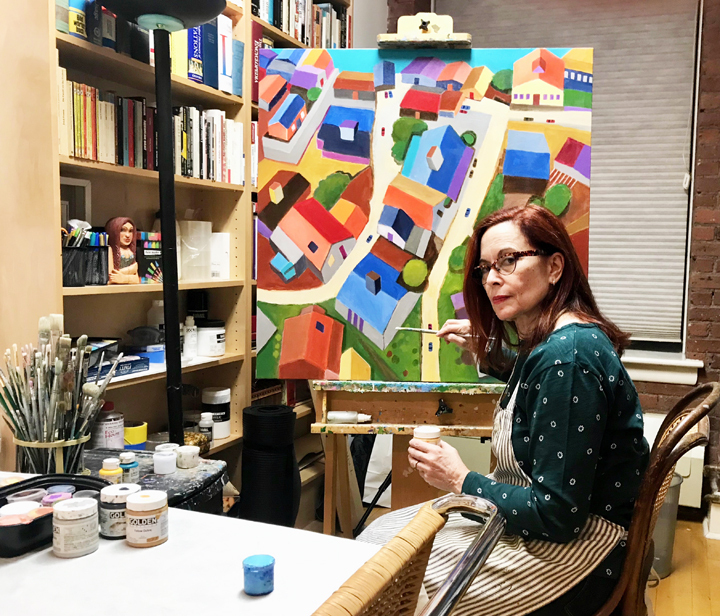 My birds-eye view allows me to combine elements of abstraction and representation, pattern and grid, surface and illusion, as well as observation and imagination. My work can be understood on many levels, from the simple interplay of shapes and colors to the narrative of the pictorial story. My raison d’être as an artist is to share my vision of the world. I want my aerialscapes to act as a commentary on our lifestyles and environment, a collection of urban and suburban ways of life as well as a representation of the natural and industrial worlds. I will be satisfied if my paintings encourage people to step back and see our world as affected by man in a different light. 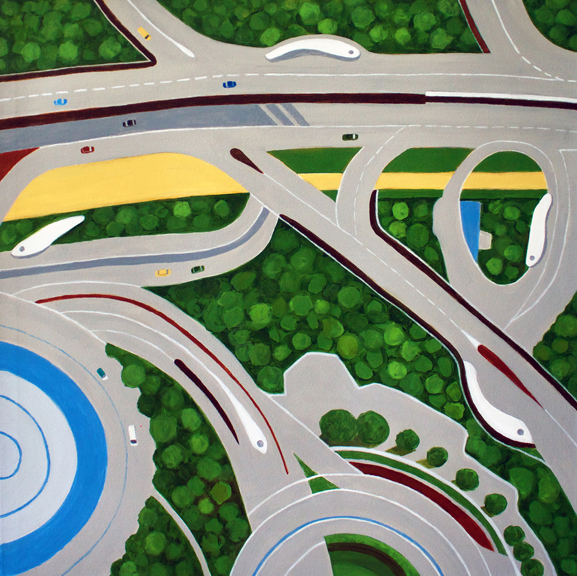 Toni Silber-Delerive, ‘Dubai Roadways’ 2016. Acrylic on Canvas, 91x91cm. Walk us through creating a piece. How do you source your reference material, and what tools do you use? I am fortunate to have visited many exciting places in the world. The discovery of new places and people never disappoints, and this forms a source of inspiration for my work. I start with a location that fits my narrative, then proceed to sketch my idea from one of my own photographs or stock material using the birds-eye view. The next step is to block out the shapes, patterns and color, working with Photoshop to further refine composition and color. Although the color and image is not necessarily realistic, there will be close similarities. Then it is finally time to work on the easel. I don’t always definitively know. Some paintings take a long time, others less. I like to put them aside and return to them. Eventually, though, it’s time to let the painting live its own life. 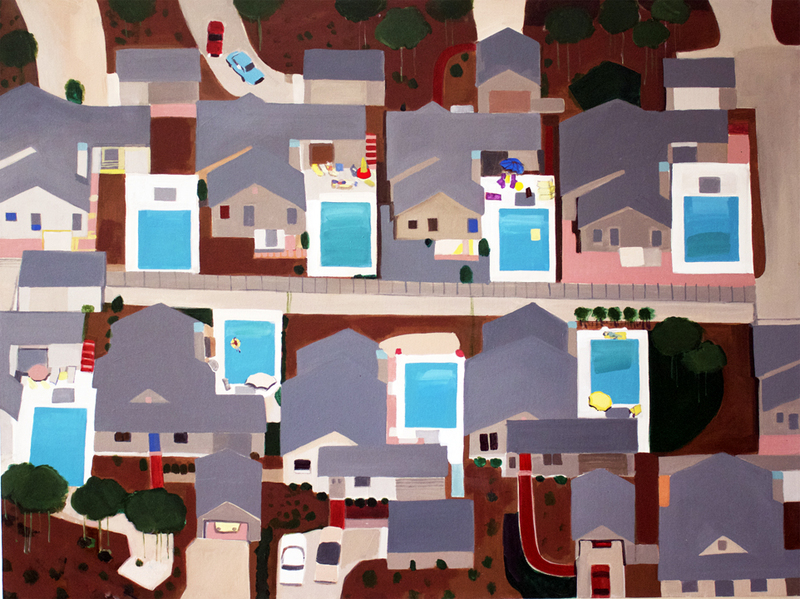 Toni Silber-Delerive, ‘Identical Pools’ 2011. Acrylic on Canvas, 91x122cm. I’m also an avid theater fan and belong to the National Arts Club, where I enjoy educational arts events. Probably the beginning of the work; it feels fresh and exciting when I don’t really know what will happen at the end. I love to surprise myself. Although most of my paintings are aerialscapes, I have spent a great portion of my time expanding their scope and depth. Starting silkscreen printing was one of those efforts. Thank you, Toni! Discover her full body of work on Singulart.